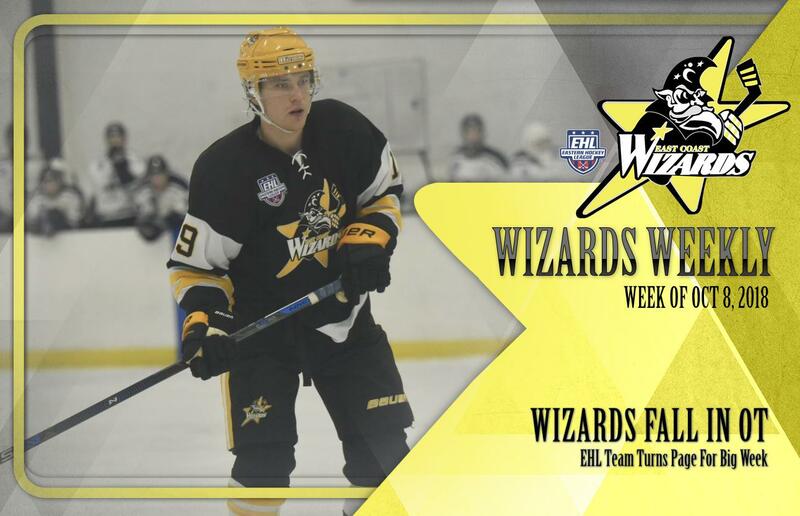 BEDFORD, MA -- The 2018-19 season rolls on for the East Coast Wizards, following a section of the schedule that had them hit the ice for just a single game in 10 days. Despite coming back to tie the score twice in Haverhill, the Wizards fell by the final of 4-3 (OT) this past Friday against the Valley Jr. Warriors. With the loss, the Wizards record dropped to 4-2-1 for the season, but now they turn the page for the next 4 days. "We've got a big week ahead of us," said Wizards head coach and general manager Freddy Meyer. "Each game was tough against the RoughRiders last season, and we all know how tight things are when we line up with the Rangers. It's definitely still early in the season, but these are 3 important conference games with some key points on the line." As Meyer mentioned, these are all conference games this week, starting with a pair against the RoughRiders on Thursday and Friday. Both matchups will take place at 1:00pm in the friendly confines of The Edge Sports Center, before the Wizards hit the road to battle the Rangers on Sunday. The goal of course is 6 points, but it's well-known that it won't be easy for the Wizards. Remember that if you can't make it to the games this week, you can catch the action live on HockeyTV. Also, be sure to follow the Wizards on Twitter, for updates throughout the season.